First Listen: 'Red Hot + Rio 2' The compilation is a star-studded tribute to Brazilian tropicalia, featuring contributions from Caetano Veloso, Beck, Seu Jorge, Beirut, Bebel Gilberto, Jose Gonzalez, John Legend and many more. Hear the two-disc set in its entirety. 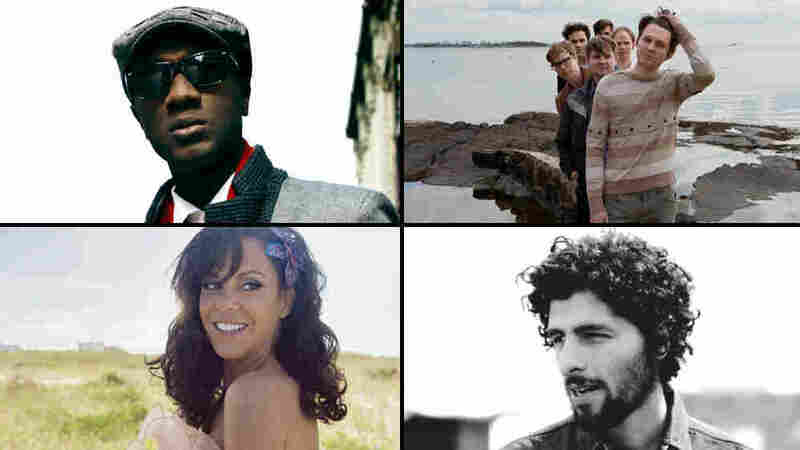 Clockwise from top left: Aloe Blacc, Beirut, José González, Bebel Gilberto. One of my favorite songs by Brazilian icon Chico Buarque goes, "Apesar de voce amanha ha de ser outro dia." ("In spite of you, tomorrow will be another day.") Released in 1978, "A Pesar De Voce" is a thinly veiled reference to the dictatorship whose ruthless grip was suffocating Brazil at the time. I think it also speaks to the power of the tropicalia movement, of which Buarque is considered a founding father: In spite of oppressive conditions, there was an explosion of film, literature and music that made an indelible mark on Brazil and the world. In all its incarnations, tropicalia was psychedelic and avant garde, yet deeply critical of the political situation of the country. The tropicalia sound is hard to describe succinctly. It mixes blues, rock, psychedelic music and Brazilian folk. In a recent Guest DJ edition of Alt.Latino dedicated to the genre, Brazilian super-producer Beco Dranoff also described tropicalia as a way of thought: challenging norms, pushing boundaries, speaking truth to power. A few weeks ago, when I received an advance preview of Red Hot + Rio 2, a tropicalia compilation curated by Dranoff and co-producers John Carlin and Paul Heck, I was thrilled. The Red Hot Organization is an HIV charity which has released more than a dozen music compilations, each focusing on a different genre. This installment features collaborations between iconic musicians like Rita Lee of Os Mutantes, Caetano Veloso and Gilberto Gil, newer Brazilian artists like Seu Jorge and Emicida, and American indie-rock bands like Beirut and Of Montreal. The end result is absolutely stunning. Out June 28, the compilation serves as a testament to the original beauty of tropicalia music (really, it's hard to improve on Antonio Carlos Jobim's "Aguas do Marco"). As a side note, for those who don't speak Portuguese, do not be fooled by the happy, relaxed tone of songs like these. "Aguas do Marco," like so many of the songs featured on this compilation, is a deeply existential meditation on the cyclical nature of life. Brilliant covers like Beirut's interpretation of Caetano Veloso's "Leãozinho" (a song about a "Little Lion" in which I swear lead singer Zach Condon sounds like the purring of the titular animal) also signify the impact tropicalia has had across generations and borders. Beck has written an ode to the genre, David Byrne long ago became a convert, and in the 1990s, Kurt Cobain famously asked Os Mutantes to get back together. Why tropicalia drives listeners and musicians of all walks of life crazy is really no mystery: It's simply great music.